Cumin or ‘Jeera' as it is popularly known is an important ingredient in Indian and Mexican cuisine. Its peppery, nutty flavour, a very distinct one, is used in seasoning and is relished by most of us. It has a lot of medicinal value, some of which is mentioned below. • Iron: Cumin is a rich source of iron, an important component of haemoglobin in blood. • Digestion: Research has shown that cumin stimulates the secretion of pancreatic enzymes necessary for proper digestion. 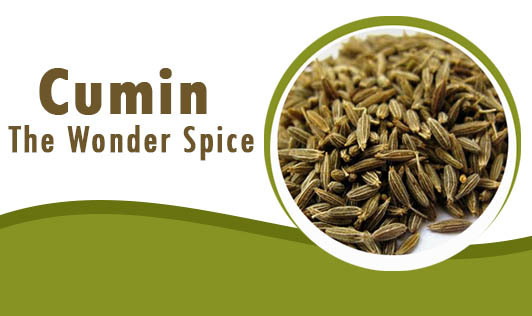 • Cancer: Cumin is known to have anti- carcinogenic properties which help protect liver and stomach against tumours. • Toxin: It also enhances the liver's detoxification enzyme, thereby helping to eliminate toxins from the body. • Memory: Cumin helps in maintaining acetylcholine in the brain, which helps to retain memory. • Skin: The high content of vitamin- E helps nourish the skin. The anti-bacterial property of cumin helps protect from fungal and viral infections. • Stress: It is known to reduce stress, and since it is a good source of B-vitamin, it helps to improve sleep. • Cold: Because of the antimicrobial and antiseptic properties of cumin, it helps suppress mucus formation that helps in controlling the progress of a common cold. • Diabetes: Cumin is known to reduce hypoglycaemia and therefore, is known to be a good regulator of blood sugar. • Piles: Cumin is also known to heal infections in the digestive and the excretory system due to the essential oils present in them. Slightly roast the cumin to bring out the flavour in them and use it more often in your recipes. That way, you can reap the benefits of this spice in your cooking.